The Seabrook chapter of the JACL installed its new officers and honored its Citizen- ship Awards recipients during a luncheon in Vineland, N.J. Pictured are this year’s honorees with Seabrook Chapter President Michael Asada. 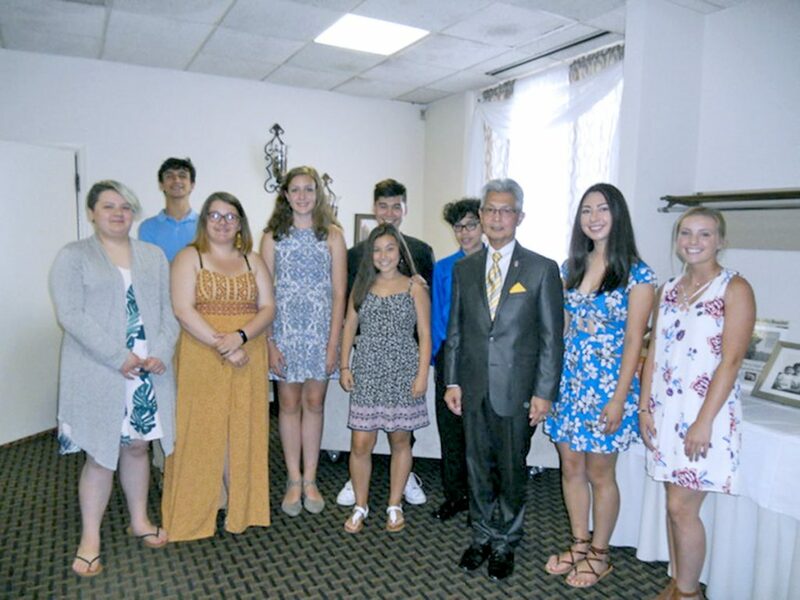 The Seabrook Chapter of the JACL held a luncheon at the Ramada Inn in Vineland, N.J., on June 24 to recognize the recipients of its JACL Citizenship Awards. Honorees were selected by the area’s high schools, as well as graduates from amongst the local membership of the JACL. Approximately 70 people gathered to honor the graduates at the luncheon; guests also witnessed the installation of the chapter’s JACL officers and board for 2018-20. Michelle Amano, former JACL national VP for operations, conducted the installation ceremony. The event’s keynote speaker was Teresa Maebori, Philadelphia JACL chapter vp, who relayed her experience in discovering her familial roots while on a personal journey to Caldwell, Idaho. During World War II, her family was incarcerated there and put to work in the farm labor camps that supplied sugar beets for the war effort at the time. Recipients of the 2018 Seabrook JACL Citizenship Awards were Citlalli Jiminez (Bridgeton High School), Jenna Silvers (Cumberland Co. Technical Education Center), Sarah Fath (Cumberland Regional High School), Hailei Markee (Millville Senior High School), Morgan Dempsey (Arthur P. Schalick High School), Jamilex Vicente (Vineland High School), Amanda Volk (Woodruff School) and Mitchell Coulter (Woodruff School).